The beginning of the year is a great time to assess what you want in the new year both personally and in your business. One key in the assessment process is making sure your thinking is not shrinking and being controlled by fear, but stays expansive no matter what negative elements might be looming in this fluid economic climate. Giving yourself and your team permission to think big, open, and creatively allows for fresh possibilities to present themselves that otherwise wouldn't; and that could make all the difference in 2013! 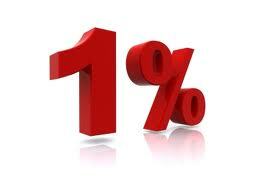 1% Edge Coaching tip: Be keenly aware of any presence of fear or limited thinking as you chart your course and set your goals for 2013.